Figures released by the Pan-European Common Bird Monitoring Scheme reveal that Europe’s farmland birds are in dire straits. Researchers compiled population figures for 145 common and widespread bird species spanning 25 European countries between 1980 and 2009. Of the 36 species of common farmland birds included in the study, 20 were considered to be in decline, and overall numbers had fallen to an all-time low, down by a massive 48% since 1980. Some of the familiar farmland species that have declined the most include linnet (down 62%), skylark (down 46%), grey partridge (down 82%) and the corn bunting (now sadly extinct in Ireland, and down 66% across Europe). Here in Ireland farmland birds have suffered serious declines too. The BirdWatch Ireland run Countryside Bird Survey, which has been assessing rural bird population and distribution annually since 1998, and feeds data into the pan-European census, shows startling declines in some of our most iconic farmland species. 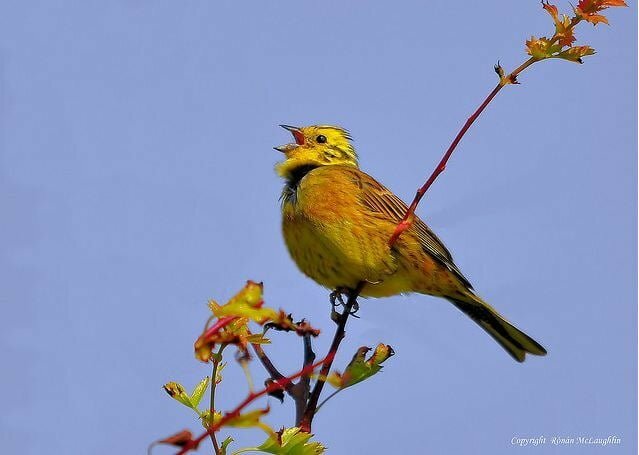 The most recent data from the survey shows the lowest ever recorded number of yellowhammer in the Irish countryside, with familiar farmland bird species like skylark and kestrel showing significant and consistent long term declines since the survey began. Conservationists point to changes in farming practices as the primary driver of these startling declines, and are pushing for urgent reform the Common Agricultural Policy (CAP) so that it encourages and supports farmers who implement conservation measures on their land and farm in a more wildlife friendly way. "The CAP offers the best opportunity to ensure the economic, social and environmental sustainability of rural Ireland into the next decade,” commented Alex Copland, Senior Conservation Officer with BirdWatch Ireland. “Farmland birds are indicators of the health of ecosystems in our wider countryside. Maintaining the health of these systems supports not just birds and biodiversity, but the soils where we grow crops or graze livestock, the water we drink and even the air we breathe. "We need to ensure that the taxpayers’ money that funds the CAP delivers the maximum benefit for farming and rural communities in Ireland, enhances our rural landscapes and protects our environment. At the moment, this policy is failing. However, we know what the problems are and we have identified a lot of the solutions already. Now we need the decision-makers to take up their responsibility and deliver a real green reform,” he said.